Haitian Voodoo is a type of religion that is said to have originated on the island of the Caribbean that is known as "Hispaniola" in the region of Haiti. In the period of the 16th century, numerous slaves were brought from Africa to the region. Most of these slaves originated from the Western area of Africa. These individuals had a unique religion that consisted of many different beliefs and several unique practices. 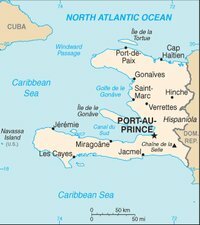 When they were transferred to Haiti, the individuals that purchased them would actually force them to convert to their religion, which was Christianity of the Roman Catholic Church. The slaves wanted to continue practicing their own religion, so they mixed aspects of the religion they were forced to practice with elements from their own religion, thus creating "Haitian Voodoo". There are many different beliefs incorporated in the Haitian Voodoo religion. First, there are many individual deities that are worshipped. It is believed that these all answer to one great God. The greatest of all gods is called "Bondye". These individuals also hold the act of worshipping their ancestors to the highest regards. They believe that there are those that engage in witchcraft that is considered to be evil. As a result, many of their practices surround protecting themselves from such forms of magick. They will pray to lower deities so that those deities can then let the greatest god, Bondye, know what the prayers are. Haitian based voodoo continues to draw the interest of many individuals. It is often regarded as a highly mysterious religion. Many associate this religion with Satanism because of the rituals that are conducted as well as the belief that the individuals that practice it are believed to perform rituals with voodoo dolls. Many of the mysteries that surround the religion are related to what is referred to as "Hoodoo" which is a type of folk magick. Practices such as nailing a poppet that is crude with a shoe onto a tree that is in close proximity to a cemetery in order to communicate with those in the spiritual world are part of those practices that are associated with Hoodoo. There are many different beliefs, practices, rituals, and magick items associated with voodoo. Many individuals do not know or understand any of the components of the religion so they draw the conclusion that the components are evil, or darkly mysterious. As a result of these issues, the individuals that practice the religion have created a document that permits an individual to view and understand the practices of the religion. This is referred to as the "Kosanba". Despite the attempt to clarify the religion, this form of voodoo still remains to be one of the most mysterious associated with any particular religion.